Do you want to learn more about the animals, fungi, and plants around you? Would you like to help scientists better understand the distribution of New Zealand’s biodiversity? If so, then the citizen-science website NatureWatch NZ is for you. You can find out more about NatureWatch at the Wellington Botanical Society meeting on Monday 17th March, at 7.30 pm on the Kelburn campus of Victoria University (Lecture Theatre M101, ground floor Murphy Building, west side of Kelburn Parade). Colin Meurk, a scientist at Landcare Research and one of the proponents of NatureWatch NZ, will be describing and demonstrating it to the society; non-members are welcome too. 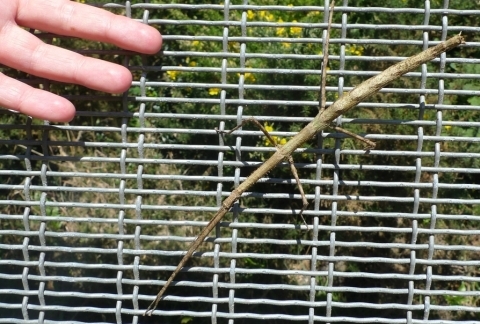 It is has now been identified by stick insect expert Thomas Buckley as Argosarchus horridus, the longest insect in New Zealand. Photo Leon Perrie. getting ‘crowd-sourced’ identifications for photos of animals, fungi, and plants (and other living things) that you previously didn’t know. This helps you extend your own knowledge of biodiversity. discovering what others have seen in your locality. assembling a record of the biodiversity that occurs in a particular area. sharing your knowledge with others, by adding identifications to their photos when you can. Slight change of plan – it will be Colin Meurk rather than Jon Sullivan giving the presentation. The text above has been amended accordingly.